Today is a new day. Well, that's stating the obvious, isn't it? Each new day offers us the opportunity to do new things for ourselves. Following a long period of being mommy and taking care of everyone and everything else, the reality of my self-neglect became a source of sadness. Discomfort often serves as a surefire agent for change. Stumbling blocks along our path to achieving personal greatness can work to our benefit if essential lessons are learned, corrective action is taken, and we redirect our focus toward moving forward without looking back. 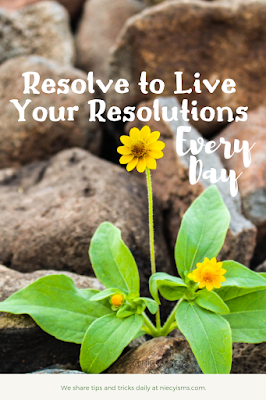 What is clear to me is there comes a moment in time when we resolve to live our resolutions every day. Words are such powerful elements in our world. Depending upon the application, certain words can either make or break us with little to no effort. Write out the full details of the positivity and success your are factoring into your life, taking time to read and review these projections, upgrading your resolution goals as necessary. Revisiting our school days, reviewing our notes was an ideal way to keep concepts and ideas fresh in our minds. We can use the same process in monitoring our progress toward our resolutions. Similarly, using a vision board to keep sight of our targeted objectives. I love this saying, "If you want to go fast, go alone. If you want to go far, go together." We tend to believe at times that we alone know our situation, also alone know our solutions. While we are all uniquely individual, we share a commonality in our shared experiences. Our tribe stands as a valuable resource for support- use it! There's an inevitability to changes occurring within our lives, as well as within our world. Challenging our comfort zones, embracing the dynamic of change evolving in each one of us, propels us to level up. Planning and preparation combined with flexibility make change less intimidating. We cannot prepare for every circumstance, we'd overwhelm ourselves with the over-planning, accept change, moving forward more informed. Revamping your life might not necessarily be the way to go forward with embracing your resolutions. Overwhelming yourself with large scale transformation without establishing attainable goals can be a set up for failure. Making big change is a process, as we are creatures of habit. Successfully incorporating small changes into our lifestyles is a big deal. Commit to little changes for a huge impact over time.